While on the flight to Seattle yesterday and back, I had a chance to finish Hal Koerner's Field Guide to Ultrarunning. Competently written with the assistance of Adam Chase, the guide is well organized from preparation to gear, from training to racing. 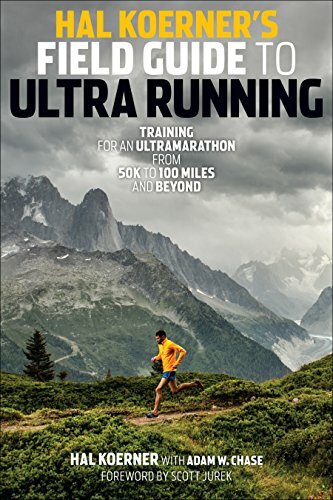 For those looking for an exciting read into the world of trail ultras, this book will disappoint. At no point does it wax poetic about the trails. Instead, Koerner focused on getting you there, and safely, so you can do the poetic bit yourself. Also, the less romantic bits like eating on the run, handling mud, and where to pee. One thing that might be misleading to some - this guide is exclusively oriented to trail unltrarunning. Wait, that's not right. It's exclusively oriented to trail racing. It does not include any ultra road races or 12/24/48 hour events and the unique challenges they pose. If you are intending to try one of those events, you'll need to seek some advice outside the scope of the Field Guide to Ultrarunning. The book is geared towards ultra-racing more than simply ultrarunning but the principles remain. The cool part about ultrarunning is you really don't need permission or a race entry to go someplace awesome to run. If you've built out the body to handle it and learned how to handle the trails, you have all you need to do an ultra-run, even if you never do an ultra-race. One pleasant element of the book was Koerner's willingness to use his mistakes as object lessons for the rest of us to learn from. I've maintained that the guy or woman who wins the race isn't always the best runner but the one who makes the least mistakes. That's how I beat the great Karl Meltzer once and no, it will never happen again. Anyway, using the real life examples, Koerner does a nice job of showing the results of bad decision-making and, sometimes, just plain bad luck. He offers good advice on how to handle it. When you get to that part of the book, listen. It may save your ultrarunning career. If you're a marathoner looking to move up, this is a book that should land on your book shelf and be referred to frequently. If you never conceive of doing anything so foolish as an ultra, it's probably not for you. If you're on the fence, though, get the book. Hal Koerner will lead you through the process, show you it's achievable, and put the tools in your hand to get there. Once you have the tools, it's up to you to go out and find the poetry on the trail.